The Snake represents Water and the organs are Bladder, Liver, Kidneys and Spleen. The Snake flows with the force in order to defeat it, he slips in anywhere without you knowing! The Snake's family member is the 'Second Son'. This form is particularly good for the whole body when done at its correct speed. 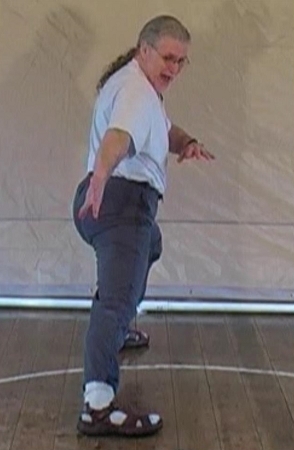 The movements from the waist are the key to this form and also to the healing aspects. This form works upon the life force meridians of Kidneys Bladder, Liver and Spleen thus toning up the whole energy system. I can attest to this as I am possibly one of the most 'tested' medically people around, so I am able to test before and after training in this form. You feel energized and alive after it. As a side line to this form, it contains some of the most deadly and useable fighting methods of any martial system, emulating the movements of the snake with its powerful mid-section acting as a turbo to throw out the upper and lower limbs with great power and speed.